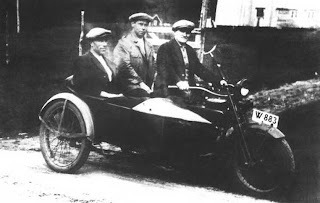 This trusty Harley with sidecar is pictured as late as in 1937. I find the bike in a well maintained and unmolested condition after lets say 15 to 18 years use. Most of those earlier bikes went out of service after WWII as well as it became hard to get parts for maintanance.